There are few times of the year that give me as much satisfaction as autumn. It’s a time of frantic activity, harvesting the bounty of summer while getting winter veg planted before the cold weather hits. Indeed, in the last week I’ve been making Basil Ravioli and picking late tomatoes, beans and even eggplant while planting winter peas, broccoli and endives. And as I type this, my household’s been plagued with change-of-season bugs, and I’m doing my best to recover from tonsillitis. But this week I had a sharp reminder that autumn means chestnuts! My pet rabbits live in the shade and protection of a mature sweet chestnut tree (Castanea sp. 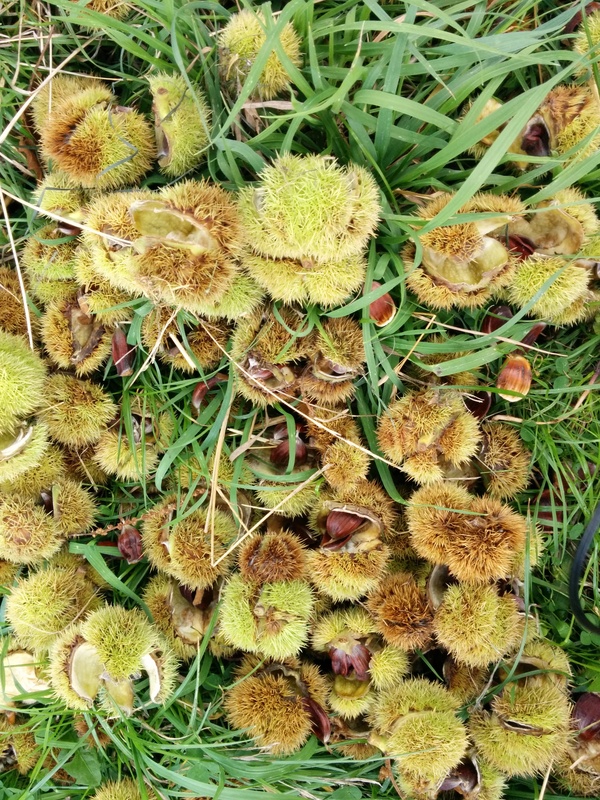 ), and a day of strong wind brought nuts tumbling on top of their hutches. While I was feeding them, one landed on my head and although it was pretty painful, fortunately no damage was done. So, I pulled out my strongest pair of winter gardening gloves and got down to the business of shucking. Chestnuts are fiddly things to process. There’s no shortcuts that I know (but any you want to share would be gratefully accepted and acknowledged! ), which probably accounts for their high price! They’re not a common nut in Australia, with most tinned or vacuum packed produce coming from overseas. 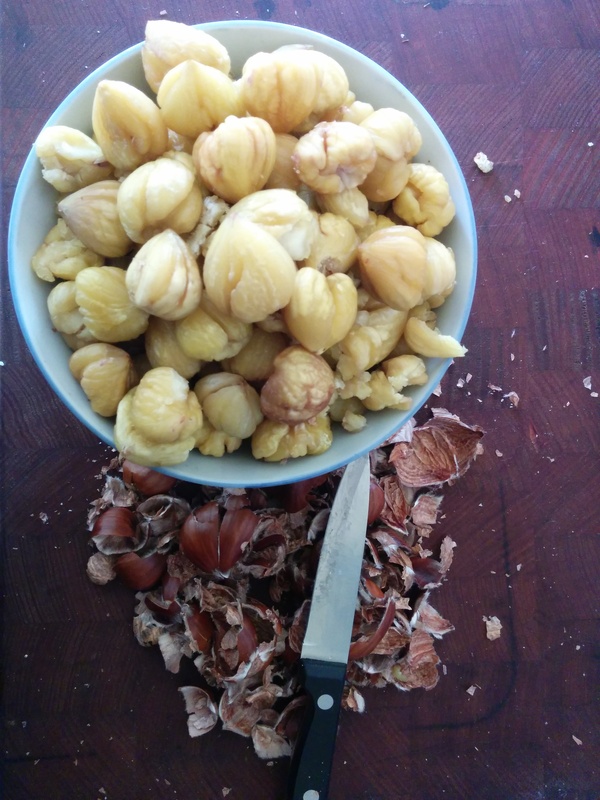 After liberating my nuts from the painfully spiky husks, I scored a couple of dozen at a time with a sharp paring knife and set them to roast in moderate oven (about 180 degrees C) for approximately 20 minutes. The scoring is important, as chestnuts can explode in the oven, making not only a huge mess but a potentially very dangerous kitchen! It is also impossible – well, I think it is – to shell chestnuts cold. The outer shell is tough and there’s an inner membrane that comes away easily when it’s hot. So, I recommend taking a few out of the oven at a time, wrapping them in a thick tea towel and peeling as fast as possible. 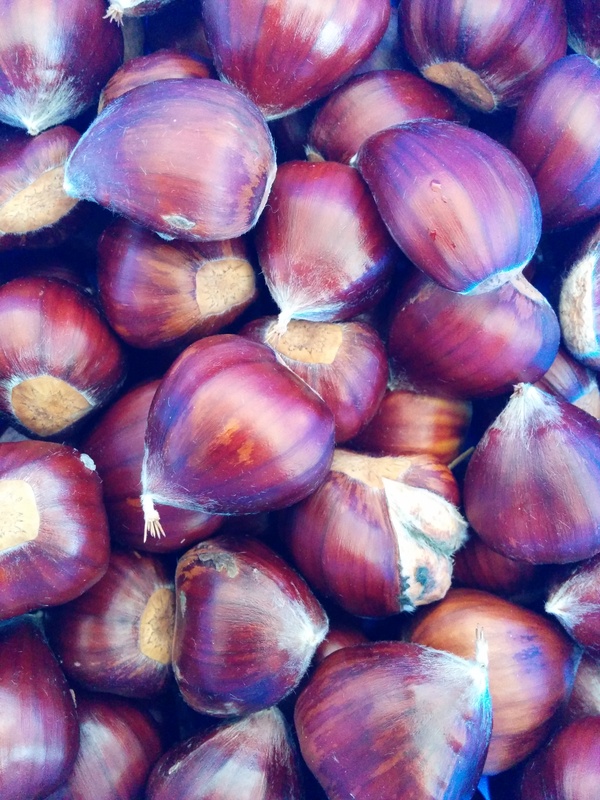 It was very tempting to scoff them all as I was peeling them – there is something so enticing about fresh, hot chestnuts. I can totally understand the northern hemisphere custom of roasting chestnuts over an open fire at christmas time. Fortunately, I remained strong, and sereval scorched fingers and broken nails later, I had quite a nice bowl to show for my efforts. So, the next and all-important question – what to do with them? Some people use them for baking gluten-free cakes and sweets, but I find them very heavy for that kind of thing and quite unappetising. Chestnuts have a slightly sweet flavour and are starchy in texture, but unlike most nuts, have little fat or protein and lots of carbohydrate. They absorb other flavours well – both sweet and savoury – and are equally lovely tossed hot in butter, ground cinnamon and sugar or coarse ground sea salt, butter and a little fresh chopped sage, rosemary and thyme. Heat oven to 180° C and heat the oil and butter in a deep frypan. 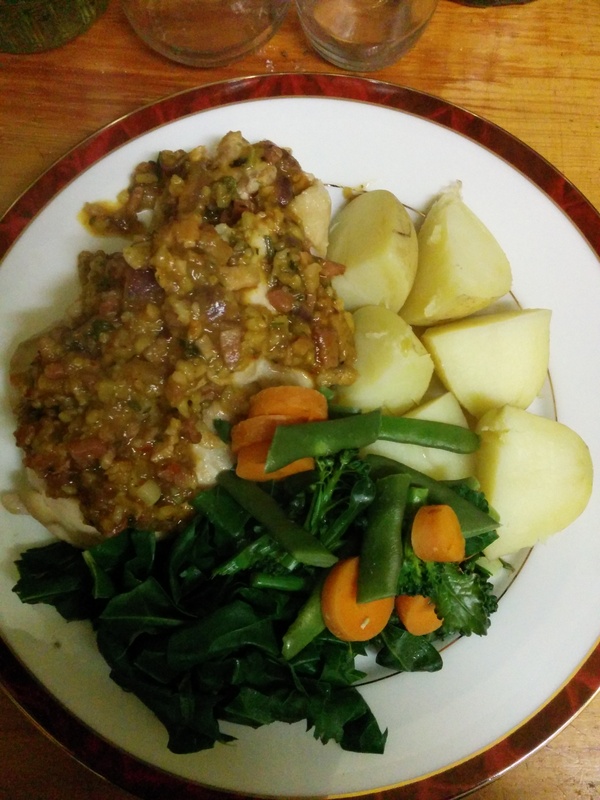 Sauté chicken over a high heat for a minute each side, then put in an ovenproof dish and bake in the oven for 20 minutes. 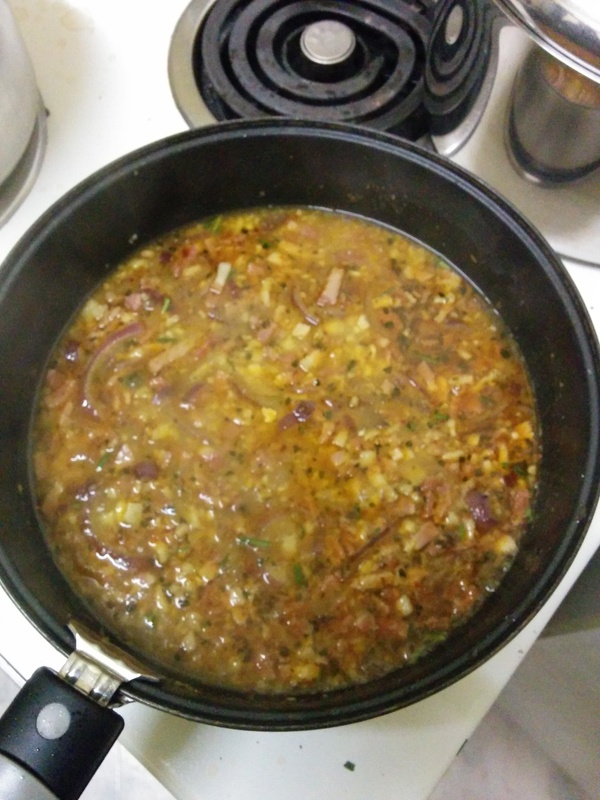 Meanwhile, in the deep frypan, turn the heat down and add sliced red onion, bacon, garlic, chilli, smoked paprika and finely chopped lemon thyme. Stirring, add the chopped chestnuts, stock powder and cup of water. Simmer gently, mashing the chestnuts with the back of a spoon and add the chopped fresh rosemary. When the chicken is cooked, the sauce should be quite reduced. Plate up the chicken and vegetables, spoon the sauce over carefully. On reflection, one addition I’d make to the sauce that’s in keeping with autumn produce is a few very finely chopped mushrooms. 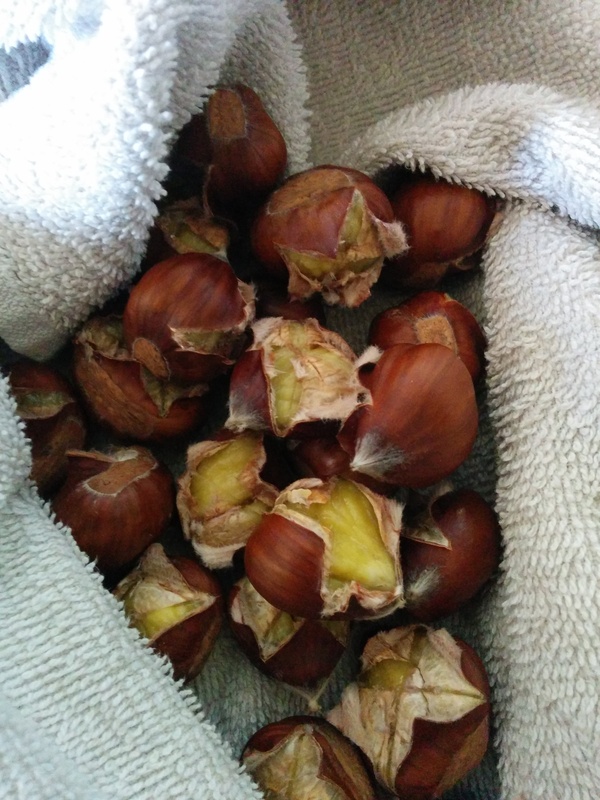 Besides my mandatory butter-tossed chestnuts, I’m planning to experiment with the rest of this year’s crop. I want to do a soup (my favourite comfort food) and a dessert with some of the apples and quinces I’ve recently been given. I’ll let you all know how it goes but please feel free to comment and share, especially if you have more experience than my few seasons struggling with chestnut shucking – I’m keen to learn!